In recent and remote historical times, the western Ionian Sea and surrounding regions (southern Italy) has been the site of destructive earthquakes and related violent tsunamis. Among other events, we recall the 1908 (Mw 7.2), 1783 (Mw 6.9), 1693 (Mw 7.4), 1169 (Mw 6.6), and 362 (Mw 6.6) AD earthquakes and tsunamis, which caused damage, devastation, and death (more than 80,000 deaths in 1908). Although such events have been studied by many authors for the great impact they produced, their origin (zone and generation mechanism) is still heavily debated both for earthquakes and tsunamis. In other words, the faults that generated such earthquakes are not yet known as it is unknown whether the associated tsunamis were generated directly by earthquakes or indirectly by seismically-triggered undersea slides. 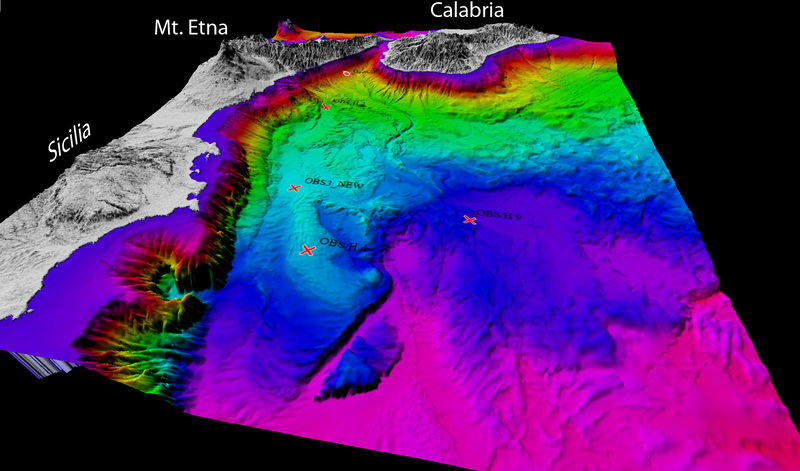 The lack of an adequate network of seismic stations at the bottom of the Ionian Sea and of a continuous acquisition of geophysical and geochemical parameters on the medium and long terms prevents the full understanding of the tectonic, seismological, and geomorphological phenomena of the western Ionian Sea.In recent years, however, the acquisition of seismic reflective multi-channel data and gravity cores taken from the seabed together with the contribution of a new permanent monitoring station allowed at least the definition of a new tectonic framework of the Ionian Sea.Faults that may have generated one or more destructive earthquakes and tsunamis have been recently identified and mapped. establish whether gravitational movements (e.g. landslides) along the Sicilian-Calabrian margins can be triggered by earthquake events of low magnitudes.